Join the tail of the 2nd vector to the head of the 1st vector. 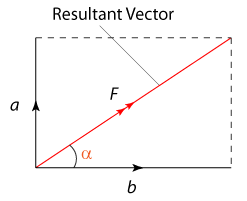 Normally the resultant vector is marked with double arrow. Join the tail of the 2nd vector to the tail of the 1st vector. Normally the resultant vector is marked with double arrow. 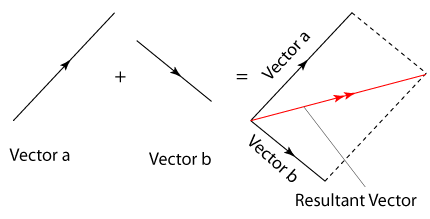 If 2 vectors (a and b) are perpendicular to each others, the magnitude and direction of the resultant vector can be determined by the following equation. Two forces, P and Q of magnitude 10N and 12N are perpendicular to each others. What is the magnitude of the resultant force if P and Q are acting on an object? 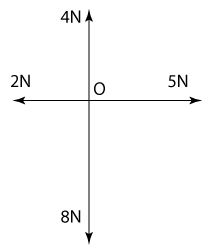 Diagram above shows that four forces of magnitude 2N, 4N, 5N and 8N are acting on point O. All the forces are perpendicular to each others. What is the magnitude of the resulatant force that acts on point O? The resultant force of the vertical component = 8 - 4 = 4N acting downward.